The theme of the three conferences is ‘Moving Gardens’. It is a moveable feast crossing three continents, and indeed it seems as if we are now stranded on the least festive, where the frugal and the edgy has been much of our preoccupation – perhaps in some contrast to the previous meeting in the ‘land of plenty’. We should, of course, as many papers here have taught us, be cautious with national myths. We should recognise diversity, and like any sensible gardener allow a good Southern winter’s frost to roll over our words and thoughts – and then see which ones have gone into seed and remain in our future work. There has been a lot of talk of identity, far more than I had expected there to be in a conference on gardens. Perhaps we should take this to mean that identities are moving too? Big Issues remind us that all world’s not just a stage – but a precious garden. Global warming and biodiversity are issues that demand wise stewardship – that word so often used by ANU philosopher John Passmore – if we are not to make all world into a desert. In certain countries the politics of nature, and the demand for stewardship, are perhaps more acutely felt than in others. Australia seems, at least to me as a humble visitor, to be such a country. The garden is a metaphor turned into obvious – and controversial – reality here. But identity is acute in this part of the world for other reasons as well. There is a tension between an old articulation of identity, going back to federation and the need to become independent, yet still Western and European – at the tragic cost of natures, cultures and languages across the continent. As the 20 th century advanced new reasons to reflect on identity emerged. Globalisation was the rubric for many of those. Diversity was increasingly regarded as an asset. Heritage and culture were more highly valued. Aboriginal art works with earth colours lay out an entire world view that is quite different from the Mediterranean white or even the grassland yellow. And in much the same way as you have had to change the meaning of the hot ‘desert’ we have had to reinterpret our understanding of the vast snow-white deserts of the North. Arctic exceptionalism – a white continent pristinely preserved for scientists – is no more true than the white North of Europe, where welfare states thrive on innocence. This may have been a noble ambition, in the land of Nobel Prizes – but nonetheless it must also be studied as a coloured (or colourless) myth. We have, incidentally, also had a ‘Green Lie,’ a generation of patchy young forests in the North considered of low industrial value. In consequence, national natures must be studied as projection screens and are utterly political. This is perhaps why I thought the idea of the Australian ‘red shift’ so intriguing.2 It is not only nationally important in Australia, it is of global significance. And even after hearing several excellent papers that made it clear that scientists, archaeologists, and ethno-botanists have been instrumental in making the ‘red shift’ happen, I still think that there is enormous potential in the continued exploration of the practices of multiple ontologies and of moving identities. Because moving they still are. I am now convinced that we will do garden and landscape history a great favour if we relate these fields even more closely than we have done so far to what we have learned in recent years from research from research on nationalism, regionalism, and identity politics. I had only one personal memory of my single previous visit to Canberra in December 1987. I now realise that even it is significant. It was in this very building.3 I had just completed my PhD, the entire piece was with the typesetters. I used the interlude to travel the world. I had heard of a book by someone called Benedict Anderson, I thought I should check it out. I came back to this library, recalling that I read this book in an almost pitch dark reading room, probably because of the contrast with the sunshine outside. I squeezed a footnote to Imagined Communities (1983) into my dissertation during proof reading, possibly one of the first notes to that book in any Swedish dissertation, but certainly not the last. Because of Anderson ‘s book, we know that there are instruments and institutions that shape our belongings and our sympathies, and that they do so in a territorial way, even though the communities they shape are imagined. It seems as if we have discovered here in Canberra this March, more than 17 years later, that belongings have colour. A ‘red shift’ is spurred by colour photography and can be traced in art. It can be found making its way not just in advertising (as several papers have demonstrated) but in school curricula and in museum exhibits. Amareswar Galla said, illuminatingly, that gardens are learning places, places to learn with and through.4 They shape emergent communities, in India absorbing old knowledge and aesthetics from Kabul and Lahore centuries ago, and today possibly in Australia. I can see many new histories being written on how and why the ‘red shift’ happened through a multitude of practices: both top-down identity politics – and grass roots emancipatory re-articulation from amateurs and professionals, artists and documentary makers, scientists and humanities scholars. Given our global and local circumstances I take this to mean that there was an ant-like somnambular truth in the early discourse of the ‘red shift.’ It was the first trembling fingertip anticipation of the nagging suspicion that it may be that society is the desert – and that its old European idea of the green garden is the true lie. We used to think that to erect the green was to enhance the human – and the ecological, as in ‘Greening Australia,’ the local branch of that global movement. As Professor Galla said, it was, after all, the British that introduced the green lawn in India, and only to take away the fruit trees and their shade from the orchard in which righteous ideas of resistance could grow. I note that the vignette of Australia in the upper left-hand corner of the front page of The Australian is now red not green. It may be taken as a sign that identity has indeed moved, just as the garden ideal has moved, from green to red, mixed with grassy yellow and earth colours. (As we know from recent elections this is not a political statement.) I think, therefore – being of metaphysical leaning – that our conference has concerned the trembling, fingertip touch that moves gardens towards the harsher fields of politics and human struggle. Somebody told me that these days you lose elections when you propose irrigation programs! And you win people’s hearts when you create new learning gardens, like the desert garden described by Sharon Willoughby that the Royal Melbourne Botanical Gardens will be opening next year in Cranbourne in Melbourne ‘s outer south-eastern suburbs. Reconciliation with earth colours is the direction of moving identities in this part of the world. Figure 1. 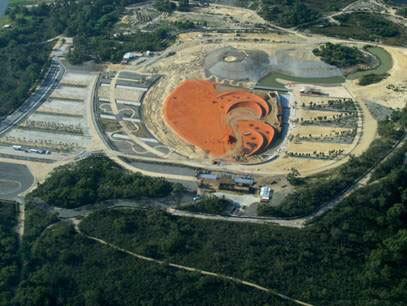 Aerial view of the Australian Garden under construction at the Royal Botanic Gardens Cranbourne. The central feature of this new Botanic Garden is a red sand garden representing the central desert regions of Australia. Designed by Taylor Cullity and Lethlean in conjunction with Paul Thompson this garden will explore the conections between Australian landscapes, cultures and plants. Figure 2. 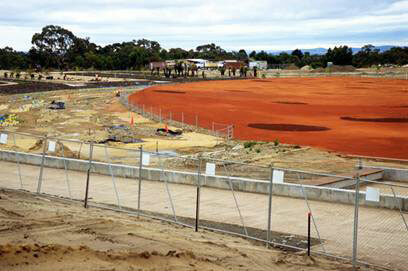 The red shift, a close-up view of the stunning red sand garden currently under construction at the Royal Botanic Gardens Cranbourne. This garden is a central feature of the Australian Garden a new botanic garden, opening in autumn 2006, which will explore the connections that exist between landscape, culture, and plants. Sverker Sörlin is Professor of Environmental History, Division of History of Science and Technology at the Royal Institute of Technology, Stockholm. 2. The panel on the Red Shift: Changing perceptions of deserts was presented by historian of science, Libby Robin (ANU), anthropologist, Deborah Rose (ANU) and archaeologist, Mike Smith (National Museum of Australia). 6. Tom Griffiths (ANU), ‘Making the deserts bloom: A counterfactual history of watering the inland’. A longer version of this paper will appear as Tom Griffiths and Tim Sherratt ‘ ‘ in Sean Scalmer and Stuart Macintyre (eds), What ifs in Australian History, Carlton, Melbourne University Publishing (forthcoming).